Find me someone who doesn’t love Chipotle Mexican Grill. I’d be flabbergasted. In fact, it seems like every student in Warrensburg gets down when they’re reminded that the restaurant isn’t in town. The company recently staged a Twitter hack, garnering them some attention, but when exposed as a hoax, landed them in hot water among fans… or did it? Take a look at how their tweets from this past Sunday makes it look like someone was mistakenly trying to do a Google search or awkward commands for Siri. The word “bizarre” just about sums it up. 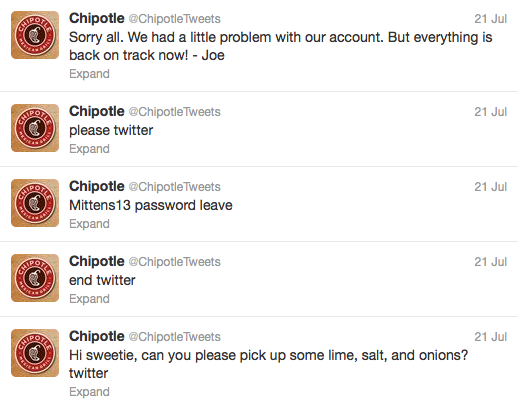 This hoax has apparently worked in Chipotle’s favor. Typically, company tweets get retweeted 75 times, but Sunday they were retweeted 12,000 times. Clearly, they’ve found a way to draw attention to themselves, but at what cost? Judging by the responses I’ve seen on Twitter, PR pros and marketers aren’t too enthused by the antics. In my opinion, it’s pretty desperate. In a sense, it’s lying. It’s a bit disrespectful to their audience, and how does sending confusing tweets fit within the context of their 20th anniversary? Then again, it worked in their favor, or so they claim. What do you think? Is faking out your audience to gain some attention fair or foul? If it’s foul, what are better ways Chipotle could build up some publicity for their anniversary?